Back in July 2014, Raspberry Pi announced the then new, Raspberry Pi 2 followed soon after by the announcement of HaTs (Hardware Attached on Top). There have been some incredible products developed that attach to the Raspberry Pi 2, 3 and now the Raspberry Pi Zero as well. Audio has been one of those incredible product ranges where in some cases a US$20 add on board competes with US$700 off the shelf DAC (Digital Audio Converter) supplied from some very large Audiophile brands. If you’re looking to make a cheap but high quality audio device, be it for Audiophile purposes, Home Theatre purposes or something else, a Raspberry Pi with an Audio HAT is a great option. Combine one of these with some audio related software for Raspberry Pi and you’re all geared up for sonic bliss on a budget. Please see our disk images page here for a list of audio software available, both free and paid for the Raspberry Pi. This page attempts to list all the Raspberry Pi add on audio hardware from around the web. If you notice anything obvious missing, please list it in the comments below and I will add it. If you are the manufacturer of any of these devices and wish to make a correction, remove it from this list or otherwise, please either add a comment below, or direct message me @marshalleq on twitter. Audio Injector is a maker of Audio HATs for Raspberry Pi that feature both inputs and outputs, potentiometers and even an electret microphone port. It’s unique hardware offerings are particularly useful for musicians. The products have been designed ‘live’ including feedback from the kickstarter community allowing re-design before shipping. Both the Injector pi and the injector Octo were successfully backed and shipped. The latest which has nearly reached it’s Kickstarter target is the Injector Zero. The injector Zero is a Rasperry Pi Audio HAT where you guide live redesigns. Full functionality – ins, outs & mic. Small enough to fit on a Rasperry Pi Zero. The Stereo Soundcard by Audio Injector provides two channels of Audio input and two channels of audio output. It provides a stackable GPIO header more in line with shield lore than that of a simple HAT. It uses crystal driven codec as a timing master and tantalium DC decoupling capacitors along with 32 bit operation. It includes input and output volume / gain knobs right out of the box. You can get one on ebay here. 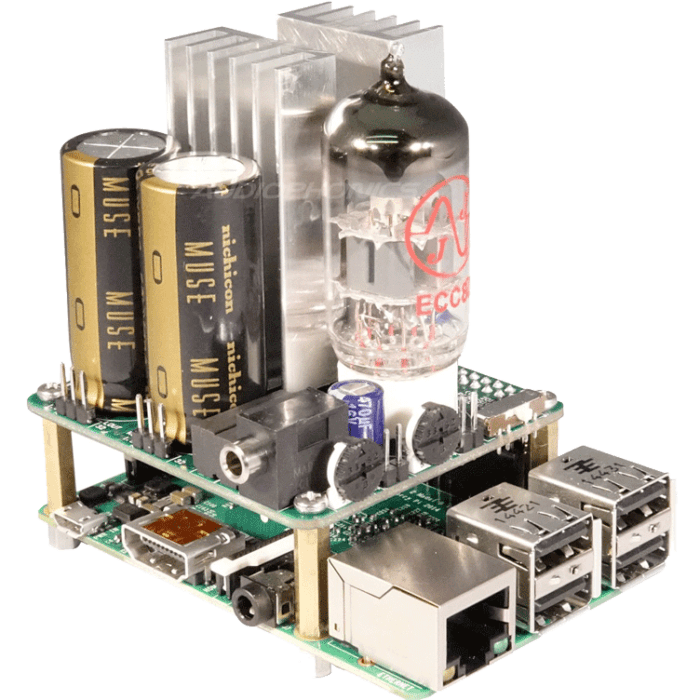 One of the most exciting audio HAT’s I’ve ever seen, The Audio Injector Octo Raspberry Pi HAT features crystal clear 8 channel audio output and 6 channel audio input. Through some apparent feats of hardware engineering, it achieves this through the I2S GPIO bus rather than USB or HDMI. It has both unbalanced RCA and ‘powered’ balanced audio output options because the system is differential. It supports customising your own breakout audio style via standard break out headers. There are more details on the original kickstarter page here. Audiophonics isa French audio oriented supplier / manufacturer of Audio Electronics equipment, including the well regarded Audio-GD brand. Their hardware is of a high standard and their kits (including those for the Raspberry Pi) are very comprehensive including many beautiful and functional options for cases. The I-DAC ES9023 TCXO is a more advanced version of the AudioPhonics Sabre ES9023 which includes a temperature controlled crystal oscilator. It supports Raspberry Pi A+, B+ and is equipped with the now famous Saber ES9023 ultra low noise ‘on’ regulator and condenser. It supports GPIO B+ or A+ Raspberry Pi as well as generic I2S ports e.g via USB. There are older versions listed on their web page, but these all redirect to this version. The I-Sabre Amp DAC is an all in one DAC and amp based on the Saber ES9023 removing the need to connect an external amplifier. It also supports use of an Infrared remote and is compatible with the usual Raspberry Pi Audio software listed here. 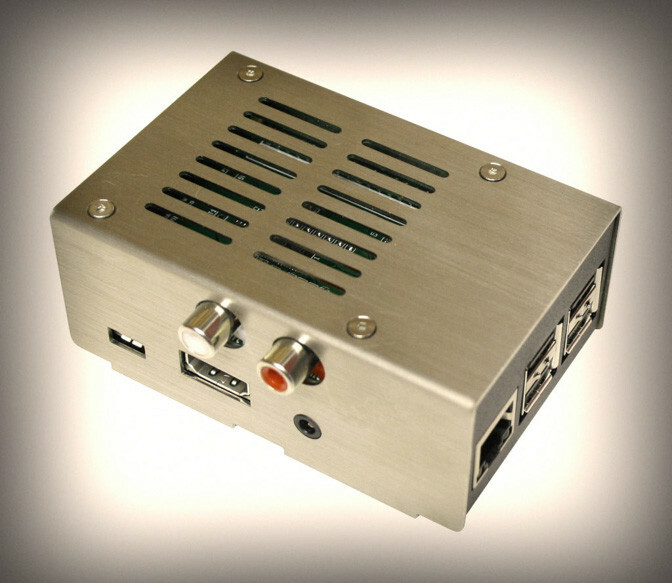 One of the nicer kits available today is the Audiophonics RaspDAC network player kit. It includes the above I-Sabre I-DAC ES9023 TCXO DAC listed above. Without a doubt the cheapest offerings I’ve seen to date. Here. Showing as all out of stock, included here only in case they become available again. HiFiBerry is a brand that makes a number of entry level priced add on hardware boards for Raspberry Pi to increase the sound quality. Don’t be fooled by it’s low price point, it has been said that the sound quality of these devices rival that of a US$700 audiophile stand alone unit. HiFiBerry currently support the Raspberry Pi 2 & 3 model B and Raspberry Pi Zero. They post an impressive array of products covering both Analog and Digital output options, plus options for dedicated power amp, separate power supply, Real Time Clock and even balanced outputs. Further, the HiFiBerry is dead simple to install in most cases requiring no soldering. They all provide access to the GPIO pins except for the Pi Zero. There are three basic ranges of HiFiBerry Audio Hats. The DAC (which is analog output), the DIGI (for digital output) and the Amp (removing the need for a separate amplifier). The DAC+ Light A high resolution digital to analogue converter available for every Raspberry Pi model. Powered directly from the Raspberry Pi I2S port, ultra-low noise voltage regulator, available with RCA outputs. Dedicated 24/192 ESS DAC, includes all materials needed in the box. Some nice case options are available at HiFiBerry that mount the Raspberry Pi and the Dac+ Light in a single box of plastic or aluminium. You can buy a HiFiBerry DAC+ light here. The HiFiBerry DAC+ Standard is the same as the HiFiBerry DAC+ Light, however it adds a higher quality Burr-Brown DAC, 3.5mm output option, Integrated Volume Control and an Integrated EEPROM. You can buy a HiFiBerry DAC+ Standard here. The HiFiBerry DAC+ Pro is the same as the HiFiBerry DAC+ Standard, however it adds Gold Plater RCA outputs or Balanced XLR, a dual domain clock circuit to lower jitter and allows modification to provide an external power supply for the analog part of the board and provides capability to connect external I2S DAC’s. You can buy a HiFiBerry Dac+ Pro here. Similar to the DAC+ Light, the HiFiBerry DAC+ Zero it designed for a Raspberry Pi Zero. It does not have the advanced features such as volume control, EEPROM, ultra-low noise regulators, but still offers good sound quality and 24/192KHz playback. It is the exception in that it is not an all inclusive kit, requiring separate purchase of spacers and a male header. You can buy one here. The HiFiBerry Digi+ standard contains high-quality S/PDIF output boards with a dedicated 24/196 chip. They include both Optical (Toslink) and electrical outputs, are bit-perfect, require no additional cables and again are powered directly from the Rasperry Pi. They have an integrated EEPROM and include all components required to mount it to the Raspberry Pi. You can buy a HiFiBerry Digi+ standard here. The HiFiBerry Digi+ Transformer is the same as the Digi+ Standard, but with galvanic isolation via a special output transformer. This is generally only an advantage for audiophiles not using an optical output. You can buy a HiFiBerry Digi+ Transformer here. The HiFiBerry Digi+ Pro is the same as the HiFiBerry Digi+ Transformer, however it includes a low-noise power regulator and a dual domain clock generator. This is the model for the audio enthusiast. You can buy a HiFiBerry Digi+ Pro here. 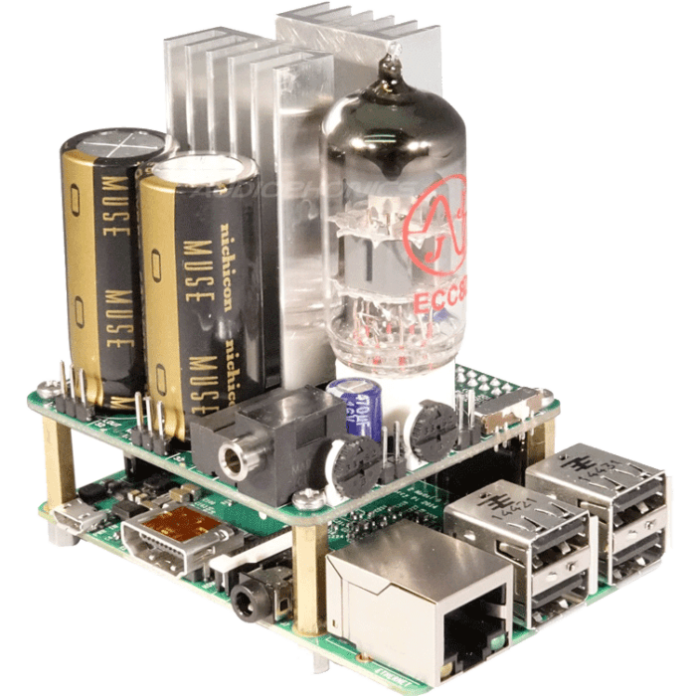 The HiFiBerry Amp+ is a high quality, highly efficient class D power amplifier for the Raspberry Pi. You only need to connect the Amp to the Pi and then connect the power and speakers. It supports speakers at 4 Ohms up to 25W output power and sample rates up to 48KHz. It has a fully digital sound path and does not require any extra cables. One 12-18v external power supply is needed which powers both the Amp and the Raspberry Pi. You can buy a HiFiBerry Amp+ here. IQaudIO make a number of differing audio products, including for the Raspberry Pi. Again featuring an impressive array of output options covering analog, digital and a straight build in power amp, supporting both the standard Raspberry Pi and the Raspberry Pi Zero, IQaudIO are another solid option. You can find their Raspberry Pi Audio HAT options here. The IQaudIO Pi-DAC+ can be plugged straight into your Raspberry Pi requiring no soldering to install. It features an integrated hardware volume control, a built in high quality headphone amplifier and advanced ESD protection. It is powered directly from the Raspberry Pi has standard Phono / RCA connectors and can take an optional infrared receiver for remote control. The IQaudIO Pi-AMP+ for PiDAC+ is a 2x35w add on Stereo Class D amplifier for the above Pi-DAC+. It is a solderless design and requires an external power supply, which provides power to both the raspberry Pi and the PiDAC+. You can buy one here. The pi-DACZero is designed exclusively for the Raspberry Pi Zero. It features integrated hardware volume, Audiophile Burr Brown DAC, Advanced ESD protection, no additional power needed, standard Phono / RCA connectors, support for a headphone board, rotary encoder and as such is one of the more fully featured audio HATs for the Raspberry Pi Zero. You can buy an IQaudIO Pi-DACZero here here. The IQaudIO Pi-DACZeroHP is an audiophile headphone daughter card for the above IQaudIO Pi-DACZero. It features a 3.5mm stereo headphone output, 24/192 playback and requires no additional power connection. You can buy an IQaudIO PiDACZeroHP here. The IQaudIO Pi-Digi+ is utilises the popular WM8804 digital output card for Raspberry Pi. It includes both optical and electrical outputs, a galvanic isloation transformer as standard on the electical output, Wolfson WM8804 chip, Advanced ESD protection and is powered via the standard Raspberry Pi I2S pins. You can buy a IQaudIO Pi-Digi+ here. The IQaudIO Pi-DAC Pro is an audiophile grade DAC for the Raspberry Pi featuring Phono / RCA outputs, 3.5mm Headphone outputs and includes supplied (but not fitted) headers for balanced XLR outputs. It’s another solderless board requiring little installation unless you desire XLR. It has an audiophile Burr Brown DAC, Advanced ESD protection and the usual DAC features from IQaudIO. 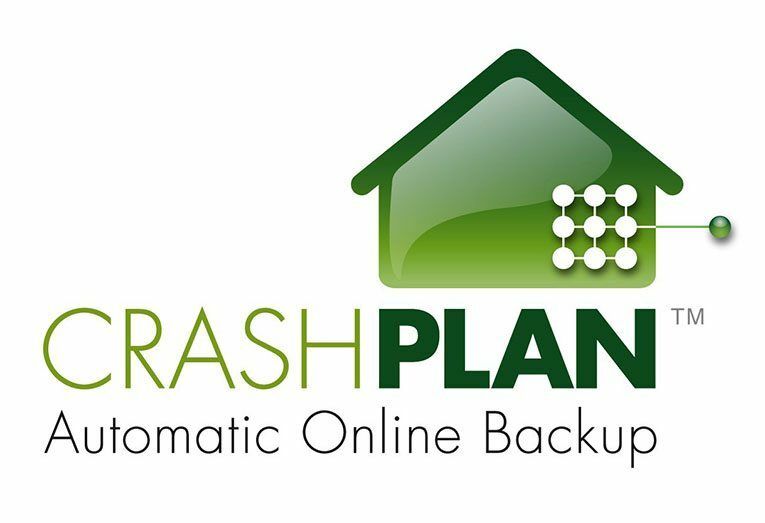 It is very well rated in reviews, outclassing many other expensive name brand solutions. You can get buy an IQaudIO Pi-DAC Pro here. The IQaudIO Pi-DigiAMP+ is a combined DAC and AMP solution in one board. It is one of the more powerful Raspberry Pi Amp’s rated at 2x35w. It supports IR sensors, rotary encoder, or i2c devices such as OLED screens. It includes EEPROM, 24/192kHz playback, solderless design, hardware volume control and powers the Raspberry Pi via it’s own power supply. It even has design support for the official 7″ Raspberry Pi Screen. You can buy an IQaudIO Pi-DigiAMP+ here. JustBoom again features yet another impressive array of audio products designed specifically for the Raspberry Pi 3B, 2B, B+ and the Pi Zero. Both analogue, digital and power amp options are available, plus some standalone options, priced very well that don’t require a Raspberry Pi at all. A unique product to JustBoom is an actual physical remote control, which is a nice touch. The Justboom Dac Zero for Raspberry Pi by Justboom is a plug and play, high resolution, digital to analog converter for the Raspberry Pi Zero and Pi Zero W. It is a no solder solution and includes all mounting hardware. It includes an optional IR receiving for remote control. It is sold as supporting 32 bit / 384kHz audio, but like others in it’s class is limited by the driver restrictions to 192kHz which is later noted in the description. It does still state that it supports 32bit though, which is the only brand I’ve noted to do so. It includes a headphone amplifier and does not include RCA outputs, this instead requires a cable to convert from the standard (but seperate) 3.5mm connection. The JustBoom amp zero is a TAS5756 class D amplifier designed specifically for the Raspberry Pi Zero. It provides 32/192kHz output, at an impressive 30W RMS / 55W peak. It includes a headphone amplifier and the usual ESD protection. Although noted as having RCA outputs, this appears to refer to the voltage rather than the connector. It does not have RCA outputs, rather screw down connectors for speaker wire. This does lead to some small doubt over their specifications as this is the second time this has been contradictory to their own product imaging. Still, a solid sounding performer at an incredible price point. The Justboom Digi Zero is the same as the DAC zero but with digital outputs instead of analogue outputs. It is simple and easy to install and use, with no soldering required. The mounting hardware is included and again it includes the ‘optional’ but included IR port which you can solder on yourself if desired. It supports both optical and electrical connectors, low jitter, bit perfect output. It has galvanic isolation for the electrical output and sports a software based volume control. The JustBoom Digi HAT is a high resolution audio output add on board for the Raspberry Pi. It supports the Raspberry Pi A+, B+, 2B or the new 3B and Raspberry Pi Zero (though the above Digi Zero is a better fit for that). It produces unmodified high quality digital audio data stream for bit perfect transmission. It supports both optical and electrical connectors, low jitter, bit perfect output. It has galvanic isolation for the electrical output and sports a software based volume control. The JustBoom DAC HAT is a plug and play, high resolution, digital to analogue converter for the Raspberry Pi. Simply stack the plug-and-play add on board (HAT) onto your Raspberry Pi A+, B+, 2B or the new 3B and it will be ready to use immediately. It has both line level RCA connectors and a headphone amplifier, requires no soldering, supports both hardware and software volume control and includes all mounting hardware. It also includes the ‘optional’ but included IR receiver in the package. You can add the JustBoom AMP, on top of this DAC HAT to add further outputs to your sound. This can ‘backpower’ the DAC HAT and the connected Raspberry Pi. The JustBoom AMP HAT (Not to be confused with the different but similar JustBoom AMP), is a high qualtity Class D audio amplifier with included DAC. It requires no soldering and includes all the mounting hardware including the optional IR port. It will power 4 or 8 Ohm speakers and is rated at an impressive 2x30W RMS (or 2×55 Watt Peak). It backpowers the connected Raspberry Pi and supports the Raspberry Pi A+, B+, 2B and the new 3B. It does support the Raspberry Pi Zero, but obviously there is a dedicated option for that above. Mamboberry made by Collybia is a high quality Raspberry Pi DAC that supports Raspberry Pi models A+/B+ and 2B/Zero/Pi 3. It has an ultra low power requirement and supports powering the Raspberry Pi from the Mamboberry power input. The full and impressive specs of the Mamboberry HiFi-DAC can be viewed here. Just to confuse you Pi 2 Design make their add on hardware and call them shields instead of HAT’s. A shield in the traditional sense is stackable (that is, other hardware can be added on top) whereas a HAT by design does not. Officially Raspberry Pi don’t support stackable hardware, however that doesn’t mean it won’t work, so this solves one of the problems associated with having two needs on a single board. The 502DAC – Pro Audio Shield is a professional I/O audio ‘Shield’ designed to bring audiophile quality to the Raspberry Pi family of Single Board computers. The 502DAC converts the Raspberry Pi I2S port to High Resolution Pro-Audio, Analog and Digital simultaneously. For more information on the 502DAC, please see their information and purchase page here. The 503HTA is one of the more exciting audio card options out there given that it includes a real tube for that ‘sweet tube sound’ that some of us like. It’s a high quality HAT that even drives a headphone port. It has a class A output buffer and Audiophile grade IRL510 MOSFET and LM317A constant current source. It supports Tube Rolling and has it’s own volume and gain potentiometers. It is also one of the more expensive and required a separate 48W 24v/2Apower supply. You can get further details and purchase the 503HTA Hybrid Tube Amp here. The Pi2Media is a profressional I/O sheild designed to extract the 7.1 surround sound audio data from the RPi 2 HDMI output while passing the original HDMI and audio to a downstream device. At time of writing there doesn’t seem to be a purchase option or further specification, however information can be found here. Of course the Chinese cloning factory has audio cards also, with their PiFi which is supposedly a clone of a HiFi Berry. Of course your mileage may vary. You can buy them at dx.com here. One of the few cards available that offers audio ‘in’, not to mention volume and gain controls, standard 3/4 Jack connectors plus a programmable button to trigger up to four different scripts depending on how you press it, this one is an out of the box audio card for muso’s. It also promises to be super low latency for all that multitrack goodness, support three types of MIDI and connect to smart phones and tablets. You can lay your hands on a pre-order here. The Pimoroni pHAT DAC is one of the cheapest audio cards available today, providing super affordable high quality audio for the Raspberry Pi in a Raspberry Pi Zero format. It supports also Raspberry Pi 2/B+/A+. It’s based on the Texas Instruments PCM5102A DAC chip and supports 24 bit audio up to 192KHz. It comes with a standard 3.5mm line out jack and has optional an landing for dual RCA connectors at only $2 extra. The branding of the below cards are either generic or unclear. Please advise if you are aware of any further information. Supporting Pi 3, Pi 2, B+ and A+, Cirrus Logic are one of the less common brands to get in on the Raspberry Pi Audio market, while their roots are from a long standing PC audio card market which died out with the integration of most audio into motherboards back in the 2000’s, it’s good to see them back in the add on board market. Also, they have just purchased Wolfson Audio, which put’s them toward the higher end of the super portable audio market. You can buy one here. The Wolfson Audio Card, extends and enhances the Raspberry Pi® audio features beyond its native HDMI output with onboard HD Audio, at 24-bit, 192KHz. It offers similar flexibility to a PC soundcard to capture audio alongside their camera, and experiment with stereo digital capture and playback. It is one of the few that has a wider array of audio connectivity options covering both playback and recording, including two in-built microphones. It has a 3.5mm 4-pole jack for a headset/boom mic combination for gaming or VoIP applications, Two DMIC microphones onboard for stereo recording, 3.5 mm jack Stereo Line Output for connection to devices such as external stereo amplifiers or powered speakers and 3.5mm jack for Stereo Line Input for high quality audio recording or capture. So that’s the first run of audio cards for the Raspbery Pi I can find. If you find any I’ve missed, please let me know in the comments so I can add them! Also, let me know if you purchase one and what your experiences are. Enjoy your new sonic bliss!